Considering that finger-picking legend John Fahey founded his own label, dabbled in everything from Indian ragas to dissonant pop, and subsequently influenced everyone from Jim O’Rourke to Leo Kottke, it isn’t a stretch to call him the original DIY artist. Consequently, it also isn’t surprising to discover that on the 13-track I Am the Resurrection: A Tribute to John Fahey, it’s the musicians of the indie rock world who come together to pay their respects. At its heart, Fahey’s music was rooted in old-time folk and blues, but by viewing these styles with a fresh perspective that straddled the line between classical composition and avant-garde psychedelia, he imaginatively reinvented them. Throughout I Am the Resurrection, the versatility of his approach is on display: Sufjan Stevens delves into the blissful, sunshine-turned-regal spirituality of Variation on ‘Commemorative Transfiguration & Communion at Magruder Park’; the Fruit Bats mines the mystical melancholia of Death of the Clayton Peacock; Lee Ranaldo paints The Singing Bridge of Memphis, Brooklyn Bridge Version: The Coelcanth with an eerie collage of sound effects and feedback; Devendra Banhart pensively meditates within Sligo River’s soothing slipstream; and Calexico playfully wanders through the disquieting atmospherics of Dance of Death. 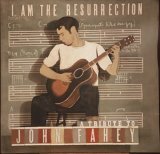 By definition, there’s nothing on I Am the Resurrection: A Tribute to John Fahey that is anywhere near as groundbreaking or strange as Fahey’s own recordings. Yet, what the performers — which also include Grandaddy, M. Ward, Cul de Sac, and Howe Gelb — accomplish is still strikingly potent.